If you decide to order SnoreMeds, you will find that you have different options, as far as packaging goes. However, you also need to decide if you have to order male or female. Now, you might be thinking this choice is pretty self-explanatory, but it’s not. It is not uncommon for a man to need a smaller size or for a woman to need a larger one. Use the available sizing diagram to make your decision and try not to get hung up on the label. They look identical. 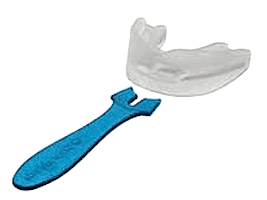 Single – $40.95 – The basic package includes one male or female mouthpiece, a spatula, and a container. Double – $59.95 – For about $20 more, you get two anti snoring devices, two spatulas, but only one case. Value – $88.95 – The value pack includes four mouthpieces, two spatulas, and one case. Shipping is $7.84 for the single and double packs, but free with the value pack. Although SnoreMeds did not work for me, I do think the loyalty program is a great idea. Every time you shop, you earn points, which can then be cashed in for different goods. When you place your initial order, you get 100 bonus points just for signing up. Plus, you get 10 points for every $1 you spend. You can check your points at any time and when you are ready to redo them they can be applied to your next purchase. SnoreMeds does have a generous money back guarantee. You get 45 days to decide if it works for you and the time starts at the receipt of shipment. The amount refunded does not include shipping and you will need to pay to ship it back.